Do you miss the glory days of survival horror? Read our DreadOut review to see if it can bring the scares! Out of all of the video game genres that fans decry as dead and gone, or at least ruined forever, survival horror may actually lay claim to that title. Many of the genre’s top titles have stopped entirely, changed genres, become terrible, or some combination of the three. In its heyday, it was never as prevalent as, oh, first-person shooters are now or JRPGs were in the PS2 days, but there were enough big titles to keep interest in the tropes afloat and enough lesser-known cult titles that seemingly many played just to get their clumsy-control-and-spooky-atmosphere fix (did anyone here play Rule of Rose? And if so, did you like it?). The recent renaissance of indie developers have given horror games a chance to come back, but generally in a slightly evolved, Amnesia-esque fashion. What’s one to do if they have fond memories of being huddled around an original PlayStation, groping their way through an ill-defined darkened environment, being propelled forward by inconsistent voice acting and the promise of some hideous beast around the next corner with limited options to fight said beast or defend yourself? One option to relieve these glory days is to inherit a haunted mansion from a distant uncle. The other? DreadOut. Now, that previous paragraph may sound like I’m damning this game with faint praise. And much of what I said was true. The voice acting ranges from disinterested, to fitting and listenable, to hilariously age inappropriate, and back. The graphics are pretty decent for a cheap downloadable title, but the draw distance and occasional texture issue may make you weirdly nostalgic for the launch window of the Xbox 360. The controls and “combat”, if it could be called such, are competent but far too reminiscent of other games – let’s just get it out there now, this is essentially a non-union Indonesian Fatal Frame. Guys, we’ve been here for five minutes, and she’s already walking AWAY from safety and TOWARDS the haunted, ruined school grounds. It’s like she’s never seen a movie ever. But don’t think I’m complaining. The thing I found myself respecting DreadOut for the most is its…pardon the pun, its spirit. Unlike many modern examples which waffle between trying to be an action game and trying to be Resident Evil 2, DreadOut commits to the ‘horror’ angle and commits hard. You’ll get the occasional jump-scare, sure, but most of the first act of DreadOut is a slow burn atmosphere-builder, putting you in an inconvenient situation that gets progressively worse until you find yourself dodging a scissors-wielding poltergeist and being chased by swarms of spectral moths. The characters are thin but defined, and while your motivations for being in the circumstances you’re in are…murky at best, it’s hard not to get caught up in the moment. A good horror movie doesn’t let you think about its flaws until after you’re done, and DreadOut shoots for this. Part of the immersion comes from the controls and camera system. Wisely taking a Dead Space-style ‘over the shoulder camera with separate aiming’ approach, you find yourself able to move about well enough for the most part and explore the environments as fluidly as you could be expected to. Combat is performed by holding your camera in front of your face and taking pictures – since, as we all know, the only thing ghosts hate more than nuclear accelerators is being photographed without warning (this made me consider the possibility that I too am already a ghost, Sixth Sense-style). 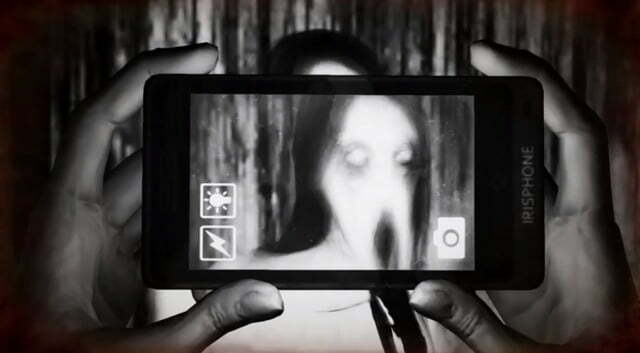 Certain ghosts require precise timing to photograph their weak points, and some of them don’t stay gone forever, but you’ll probably find yourself more grateful for the existence of camera phones now than you’ve ever been. Remember when Instagram was just pictures of dogs and pizza? Shame about the demon invasion. The combat, in its way, helps to build that sense of tension and atmosphere DreadOut aims for. Even in some of the more revered titles in survival horror history, your character at least has a few firearms and a giant pole to fall back on. 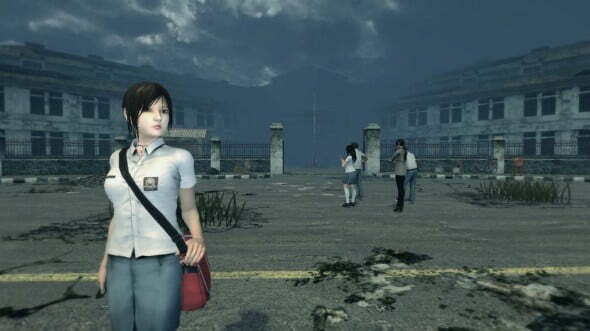 DreadOut puts you in the shoes of a female high-schooler with nary but a cheap Android phone and her decent skill at running to see her through. The fact you’re a girl isn’t played up like it is in many other horror games; you’re never threatened in the way female game characters are threatened, your strength or lack thereof is never made into an issue, and you get the impression she’s handling her trials the same way a male character would. Also, in a rare choice for the horror genre, you never say a word – your past and personality come through mostly from one-sided interactions with your friend, and it helps build a sense of history even if you yourself are an empty vessel. DreadOut is, of course, not perfect. As mentioned before, the voice acting is really inconsistent, but at least in a humorous way – nothing as memorable as Jill Sandwich, but it also won’t grate to the point where you mute your speakers. The graphics are passable but flawed, and you’ll have a very difficult time picking up on objects you can interact with until you’re right on top of them. During combat, you’ll find yourself frequently either too far or too close to the ghosts you’re trying to fight and the majority of your deaths will stem from accidentally being trapped in a corner as opposed to anything the ghost itself does. But think about this – how many survival horror games have you played where every single thing works flawlessly? Heck, how many games can you describe like that in general? Yes, DreadOut has issues. The plot is kind of bland upon further thought (and features at least one example of a revelation that means to be tragic but comes off as kind of ham-fisted), the combat tends to get a bit repetitive, and it looks like an early 360 game. But you know what? If you can take the time to give a crap, you'll like it. You have to slow down and enjoy all the world-building the game does, and you have to have an appreciation for local folklore, but the atmosphere and tone of this game is rewarding in a way few 'horror' games try for. If you're sick of being scared by gross sounds coming from mansions or industrial areas, or if you're still bitter about the last Fatal Frame never coming out in America, why not give DreadOut a try? Besides, the second episode is free, and the first one is cheap and short – if you don't like it, maybe Act 2 is more your speed! Tim has been a gamer since the very first Goomba in Super Mario 3 killed him one Christmas. He lives outside of Detroit and is very picky about music and beer.